Today marks the 40th anniversary of the 1973 Middle East Oil Embargo. On this day 40 years ago, Middle East oil ministers recommended an embargo against nations supporting Israel in the Yom Kippur war and mandated a cut in oil exports. 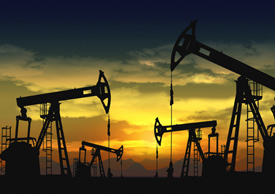 The embargo and subsequent actions by the Organization of Petroleum Exporting Countries (OPEC) caused oil prices to climb steeply, affecting other energy sources as well and triggering many efforts to improve energy efficiency. Oil prices subsequently shot up—from about $3 per barrel prior to the embargo, to eventually more than $100 per barrel in 2008, with prices fluctuating since then. These price increases affected not just oil, but also electricity prices (at the time of the embargo, 17% of electricity came from oil) and natural gas prices (since gas can be substituted for oil in many applications). The higher prices in turn motivated changes in consumer behavior and a variety of policy actions, such as automobile and appliance efficiency standards, the Weatherization Assistance Program to assist low-income households in reducing energy use, the State Energy Program that helps fund state energy offices and their many activities, and dramatically expanded R&D efforts to develop more efficient technologies. As a result of responses to both rising prices and policy actions, as well as technological developments, U.S. energy use patterns have changed. Most significantly, passenger vehicle fuel economy has increased from an average of about 13 miles per gallon in the early 1970s to about 25 miles per gallon for new vehicles today, despite the large increase in the market share of trucks, vans, and sport utility vehicles in recent decades. More broadly, over the past four decades the United States has become more energy efficient. 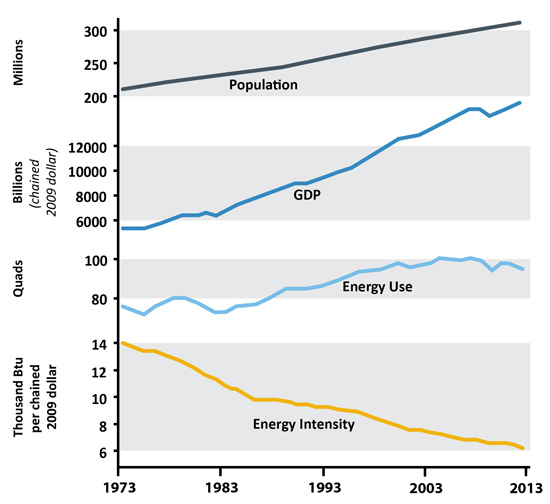 U.S. energy use increased by just 26%, from 75.6 quads in 1973 to 95.1 quads in 2012, while population grew by more than 50% and GDP (in 2009 dollars) grew from $5.4 trillion to $15.5 trillion. 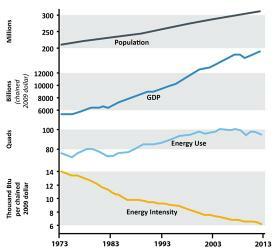 Consequently, energy intensity (energy use per dollar of GDP) dropped by more than half. Had energy growth continued at the rates experienced from post-World War II until 1973, energy use in the United States today would be at least 40% higher than it actually is. In other words, energy efficiency, in effect, is the nation's largest energy resource. However, we can do much more. A 2012 ACEEE study estimates that if we really set our minds to it, we can reduce energy use in 2050 by 40-60% relative to a business-as-usual scenario, without sacrificing GDP growth. Further improvements include much higher vehicle fuel economy; reduced vehicle miles traveled due to shorter travel distances and less use of cars; and continued efficiency improvements in our factories, commercial buildings, and homes. Standards adopted last year will take us from the present 25 miles per gallon of new vehicles today to roughly 40 miles per gallon (“real-world” value) in 2025. ACEEE estimates that we could reach around 77 miles per gallon for new vehicles in 2050, including extensive use of hybrid, electric, and fuel cell cars. If we act aggressively, by 2050, today may be remembered less as the 40th anniversary of the oil embargo, and more as the midpoint on our path to a truly efficient economy.